Quite the shot: Nikola Tesla appears in a multiple-exposure photo in 1899, while a Tesla coil discharges millions of volts. Want to see more old sparks flying? 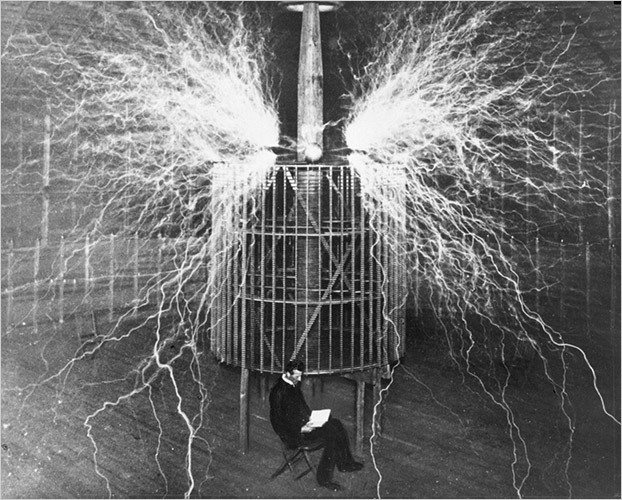 Here we have an image of Mark Twain, the literary giant, tinkering in More Tesla's laboratory in 1894.
anyway he is unique and mysterious in the history of mankind, but is he holy or evil? his inventions are the most paradox, i met him somewhere in this gigantic universe, but i could not actually remember the particular site where it was, it long time before WW-I.